A fresh and light creamy dessert, perfect for a sweet treat after a meal. 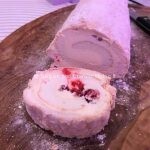 This Meringue Roulade looks stunning for a centre piece dessert. 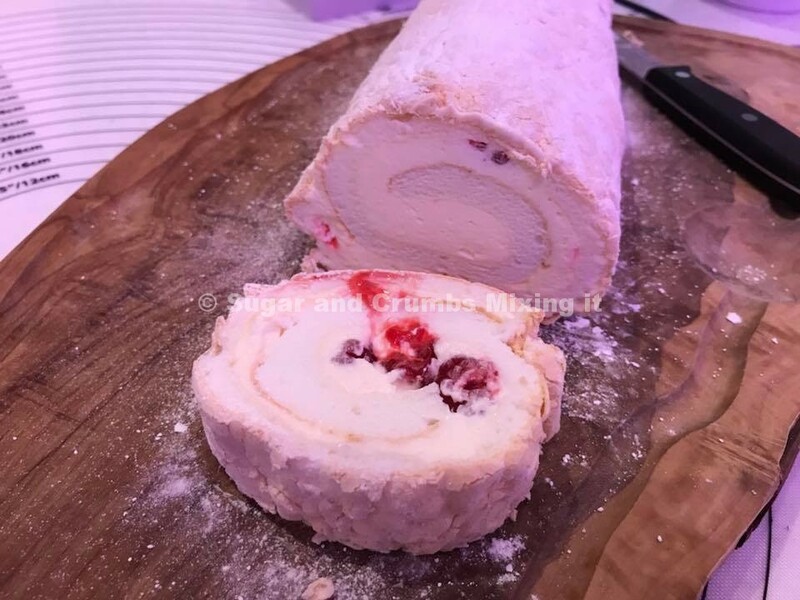 Meringue Roulade with Fresh Cream and Raspberries (or fruit of your choice). 1. Grease a baking tray with butter, approx 23x32cm rectangle shape. If you are using a smaller baking tray you will have some meringue left over. 2. Place some baking paper over the top and press down to stick to the butter. 3. In a clean mixer whisk the egg whites, lemon juice and salt together until they form soft peaks. 4. Mix the icing sugar and caster sugar together in a separate bowl. 5. Add 1 teaspoon at a time to the egg whites whilst the whisk is moving. Repeat until all the sugar is mixed in and the mix is a glossy consistency that holds when lifted. 6. Spread the mixture over the tin evenly and then bake in the oven for 15 mins. Remove and leave to cool for 15 mins. 7. Whilst the meringue is cooling make your filling. 8. Beat the cream with a whisk to create a very soft peak. 9. Add in 50g of icing sugar and then beat slowly (watch it as if you over beat the mixture the cream will curdle). 10. When ready to assemble, spread another piece of baking paper out the same size as your meringue on a clean surface. Cover the paper with a sprinkling of icing sugar. 11. Carefully lift the meringue and flip onto the icing sugar covered paper. 12. Peel away the paper carefully ( the top of the meringue becomes the outside) and spread the cream filling evenly over the meringue. 13, Cover with raspberries or your choice of fruit. 14. Starting with the smaller side of the meringue use the paper to help you roll up the roulade and gently tighten until it is all rolled up. 15. Transfer to a serving plate and sprinkle with extra icing sugar. Keep in the fridge and eat within two days. This recipe can be frozen for up to 1 month. Cover with the baking paper you rolled it up with then cover with clingfilm and freeze. To defrost take out of the freezer 3 hours before needed. Eat the same day.